This Recipe is meant for Boy Scouts. Warm dutch oven over a few coals. Gently melt the butter in the dutch oven. Add graham cracker crumbs and 1/4 cup of sugar. When the dutch oven is safely cool, use your fingers to pack the crust evenly over the bottom and up the sides of the dutch oven at least 2 inches. Put lid on the dutch oven and Bake at about 350 degrees for about 10 minutes. While crust is baking, soften cream cheese in a large bowl by blending it with a large spoon or spatula. When cream cheese is smooth, add 1 1/4 cup sugar, flour, and vanilla. Blend until smooth and uniform. Blend sour cream into cream cheese mixture. Blend in each egg, one at a time, ensuring each egg is mixed in before adding the next. Pour the filling into the crust. Put lid on the dutch oven and Bake for another 50 minutes. 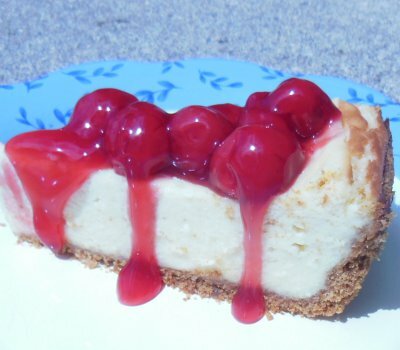 If the center area of the cheesecake that still looks soft, and jiggles when you shake the dutch oven a bit, is bigger than 2 inches, then bake it another 10 minutes and check again. If smaller than 2 inches, then it is done. When done cooking, remove from heat, put the lid on, and let it cool for at least an hour. As soon as the dutch oven is cool enough to touch, you can speed up the cooling by placing it in a shallow water bath, such as a stream. The longer it cools, the better. Pour topping on each piece when served.